In a report released by UNICEF in 2012 on child poverty in 35 industrialized countries, Canada lies in the bottom half of the group (24 of 35) despite the government’s 1989 pledge to eradicate child poverty by the year 2000. At 13.3%, Canada’s child poverty rate is almost 2 percentage points higher than the national average and twice as high as that for seniors. Canada’s tax-transfer programs more effectively lower poverty rates among the elderly than among the young1. 1UNICEF Innocenti Research Centre. 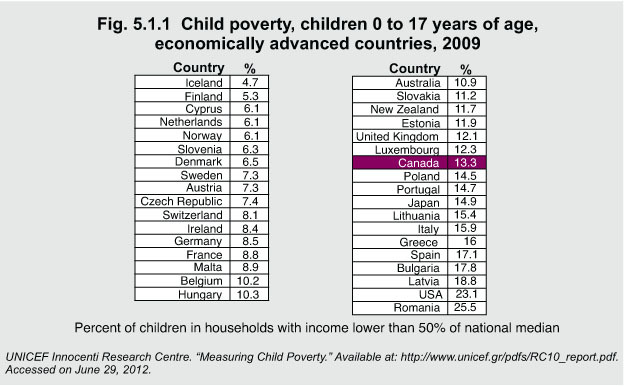 “Measuring Child Poverty.” Available at: http://www.unicef-irc.org/publications/pdf/rc10_eng.pdf– accessed June 29, 2012. 2 Corak M. “The Sad, Sad Story of the UNICEF Child Poverty Report and Its Critics.” Available at: http://milescorak.com/2012/05/29/the-sad-sad-story-of-the-unicef-child-poverty-report-and-its-critics/ – accessed on June 29, 2012.